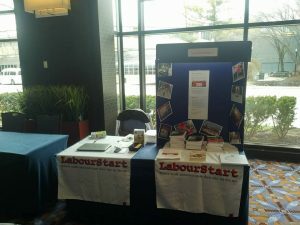 Our stall at the Labor Notes conference in Chicago this weekend. Algeria: Our campaign in support of the independent energy workers union has been extended by a month at the request of the global union federations. It has reached 9,925 messages sent, making it the largest currently-running LabourStart campaign. I encourage all of you to help us get that number up past the 10,000 mark in the next few days. Brazil: We collected and publicised widely the many statements by international unions condemning the arrest of former president Lula. Georgia: Three Georgian news stories this week got special attention on LabourStart and wide promotion by us on social media – the mining disaster in Tkibuli in which six workers died, a hunger strike by port workers in Batumi, and the court decision in support of Rustavi Azot workers, who were the subject of a recent LabourStart campaign. Our 8-week old campaign supporting the Georgian unions’ call for a new labour law is up to 6,070 supporters. Eric will be travelling to Georgia in another 13 days and will meet with trade union leaders then. Global: We continued doing weekly promotions on social media aimed at attracting new, individual subscriptions to the English mailing list. We also began preparing for our annual fundraising appeals, both to individuals and to major union donors. Iran: Our campaign demanding the release of Esmail Abdi, which is getting close to the 3-month mark, has now reached 8,356 messages sent. This is the most recent of several campaigns we’ve run demanding his freedom, and is our second most popular current campaign. North America: We had a strong presence at the Labor Notes conference in Chicago organised and led by Derek, who drove from Ontario. We also promoted this effort in a mass mailing to our US and Canadian lists, and with a dedicated website. We had a fully kitted-out stall, distributed flyers, sold books, and signed up new supporters. Turkey: We signed up a new volunteer correspondent, who works for a well-regarded project called Solidarity TV. Meanwhile, our current campaign targetting Roy Robson is up to 7,670 supporters and is running in 16 languages. UK: We designed and printed 1,000 full-colour leaflets for distribution at upcoming events, including this week’s Unions 21 conference in London, with a link to a dedicated website very similar to the one we did for Labor Notes – this will be template for other ‘welcome to LabourStart’ websites as needed. Ukraine: We responded to an appeal by metal workers, urging them to get in touch with IndustriALL. USA: At the request of a union webmaster in Michigan, we finally completed the creation of RSS news feeds for all 50 US states, updated automatically every 30 minutes.